What is my soap trying to tell me? Filed to: Soap on a rope for the pope?Filed to: Soap on a rope for the pope? 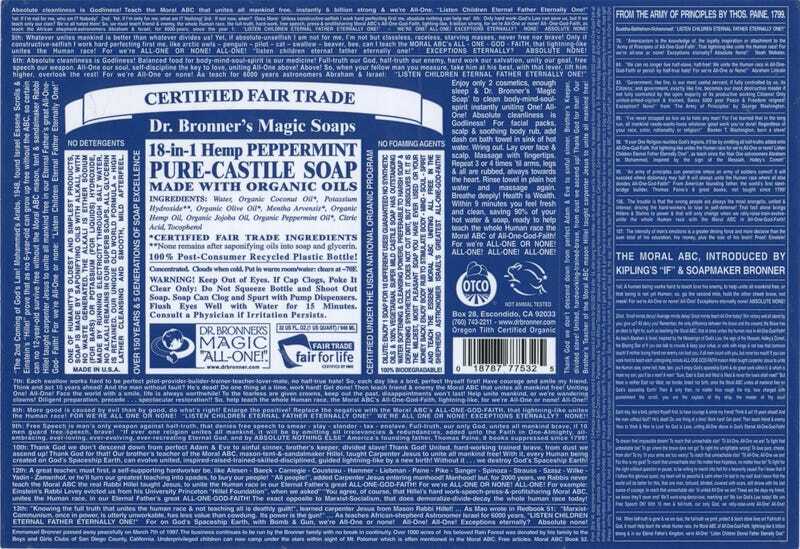 Have you ever read the label of a bottle of Dr Bronner's Castile soap? I always thought it was just a bunch of literal fine print. But I needed something to read on the toilet (what? Like you don't do this) and grabbed the bottle sitting next to the sink because it clearly had plenty of reading material. Turns out, it's covered in text going in several directions, about the All-One-God-Faith, faux quotes from Abraham Lincoln and Booker T. Washington et al., and lots of talk about the Moral ABC. Also they seem to like Thomas Paine quite a bit. Had no idea my cleanliness was literally so close to godliness all this time.